Project Amigo has a long history in Colima, Mexico. When Ted Rose first visited the state of Colima, back in 1984, he went to hike on a volcano. But, instead, he took the wrong bus and found himself in a little poverty-stricken village. That mistake, and a few other fortuitous events, led to his decision a couple of years later to trade his comfortable life as the owner of an office machine company for a life surrounded by wonderful, and very poor, children who appeared to need a helping hand if they were ever to break out of poverty. In December of 1984, he and his wife Susan Hill went to Colima to hold a Christmas party for the 50 disadvantaged rural poor children that Ted had met a few months earlier. The children lived in an albergue (a room and board facility provided by the State Education Department to help families send up to three of their children to primary school). In 1986 Ted and Susan moved to Mexico and set up a small typing school at the rural albergue. Boys and girls in fifth and sixth grades learned to type, and discovered that a skill like that could help them find better employment in the future. Project Amigo’s involvement with the other three albergues in the state began in 1990, bringing educational materials, access to dental care and cavity-prevention programs, and stimulating field trips to nearly 200 children each year. These programs were (and still are) intended to keep children motivated to stay in school to finish their primary school education. As support from friends, Rotarians and Rotary Clubs grew, Project Amigo expanded its mission and its programs. Efforts to improve education and health standards at the migrant labor camp in Queseria began in 1997. 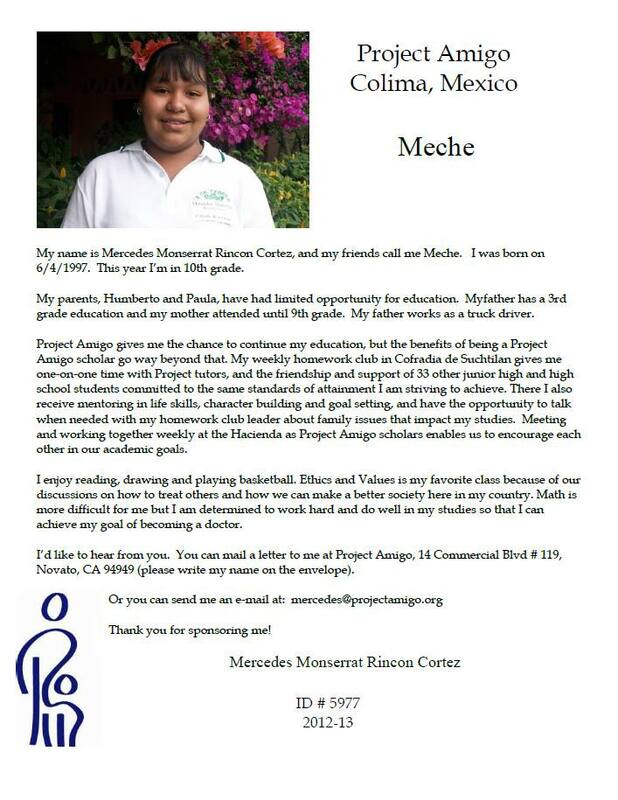 Over the years, Project Amigo has built two classrooms, a kitchen, children’s bathrooms, and hired two teachers. Playground equipment, a protective fence around the school grounds, and a roof over the veranda of the school have been added with funds from Rotary Foundation matching grants and donations from individuals and Rotary Clubs. The State-run albergues were closed in 1999. 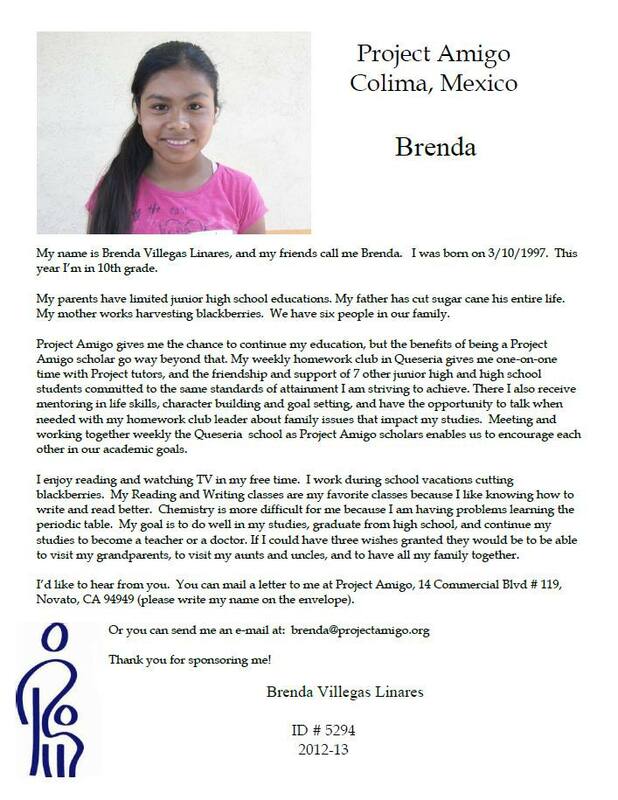 Project Amigo continues to offer incentive programs to needy 4th, 5th and 6th graders in rural communities in the Colima area. The scholarship program in place today had its humble beginnings in 1996. It has grown from offering seven junior high school scholarships to providing 110 scholarships a year for junior high, high school and university. 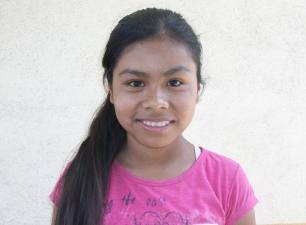 The Rotary Club of Santa Rosa sponsors children and scholars each year. I am writing to thank you for all the support you have giving me to continue studying. Some day pass by since I started my vacations and I am very happy because in my last test I got a better grade than in any of the other ones. I got a 9.6 out of them and I hope this coming semester I’ll do even better. I want to share a little about these past days during Christmas and almost New Year. Days are going too fast but, I am very happy because I was with all my family. On Christmas we went to my aunt’s house and even though we sleep early I had lots of fun. I hope you share how your Christmas was and how your days are going. I hope you are really happy and enjoy this holiday season well hope you had a Merry Christmas and have a Happy New Year. Happy New Year!! We have a couple of pieces of good news to share. First — When we started Project Amigo more than twenty-five years ago, we had the dream that friendships would develop between our North American friends and the poor rural kids of Colima, Mexico. The dream came true; and, as a result of these friendships, thirty three (33!) kids have graduated from the University of Colima, found good employment and have pulled themselves and their families out of poverty. Many of our North American friends have reported that they, too, have benefited and grown as a result of their visits and friendships with these students. We’re pleased to add that twelve (12!) more students will graduate from the University in 2013!! One hundred scholars a year are working their way through the Mexican educational system thanks to scholarships funded by our American and Canadian friends; and thanks to our homework clubs and support team that provide these students with more than help with their homework. Jorge and Lety mentor the students, help them resolve personal and family problems, and provide the tools the scholars need to face and overcome challenges; in doing so they help prepare them for the world they will face after they complete their education. 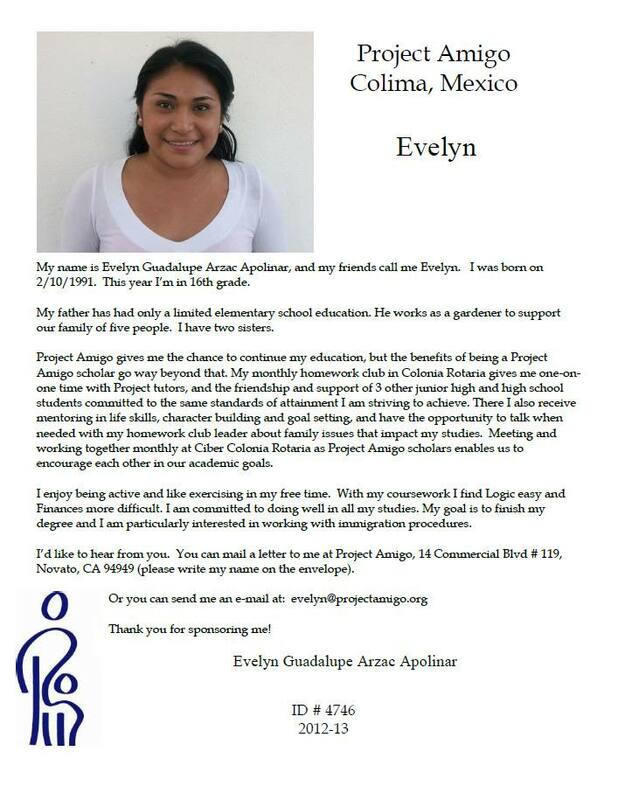 We expect more than 80% of our scholars to graduate from college. The staff in Colima is strong, effective and professional in every respect. Visitors to Project Amigo inevitably and invariably give five-star reviews to our crew as an effective and happy team. We are very proud of each staff member and the fine work they do – whether it’s looking after our students, or looking after our visitors’ well-being. We are proud of you, too. Our Amigos from North America provide the funds we need to pay school fees, to support the needs of the kids, and those of the project as well. Your donations, your love, and the kind notes you’ve sent to your students have inspired them to dream even bigger. We look forward to hearing from you by email, and to seeing you when you visit. With all our hearts, we thank you for the roles you’ve played in making our dream come true. 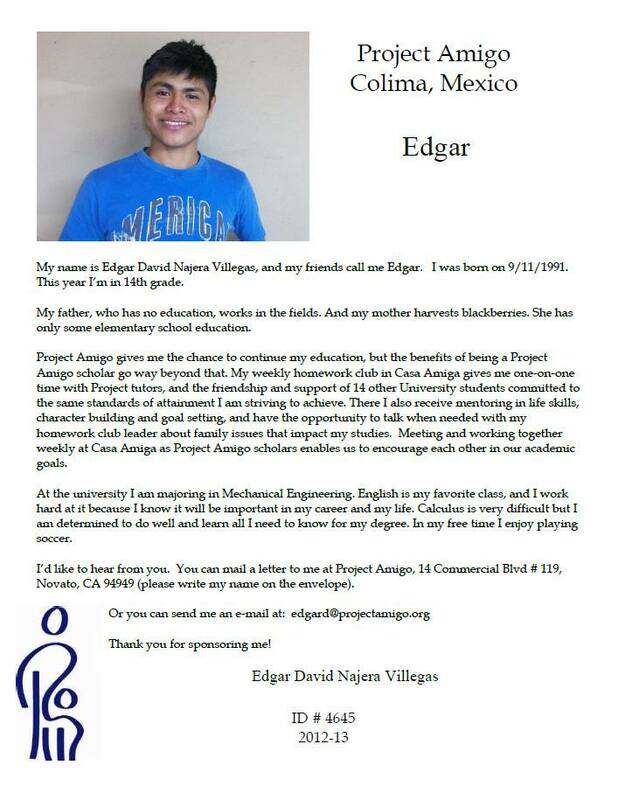 Please continue your support as Project Amigo continues forward. Most importantly, thank you for making success possible for the thousands of kids who have benefited from Project Amigo’s efforts over these many years. We hope your Presidential year is off to a great start! Ted and I enjoyed the opportunity to be the program at Santa Rosa Rotary in May to update the members on Project Amigo. We’re honored to be named an “anchor project” of the Santa Rosa Rotary Club. After the meeting several folks expressed interest in the Humanitarian Service Weeks in Colima. I’m attaching our most up-to-date brochure with the hope you’ll share it with your members. In a month or so, we’ll be sending out the sponsorship renewals for this school year. We hope the Club will continue its support of your students! Please visit the Project Amigo Website. 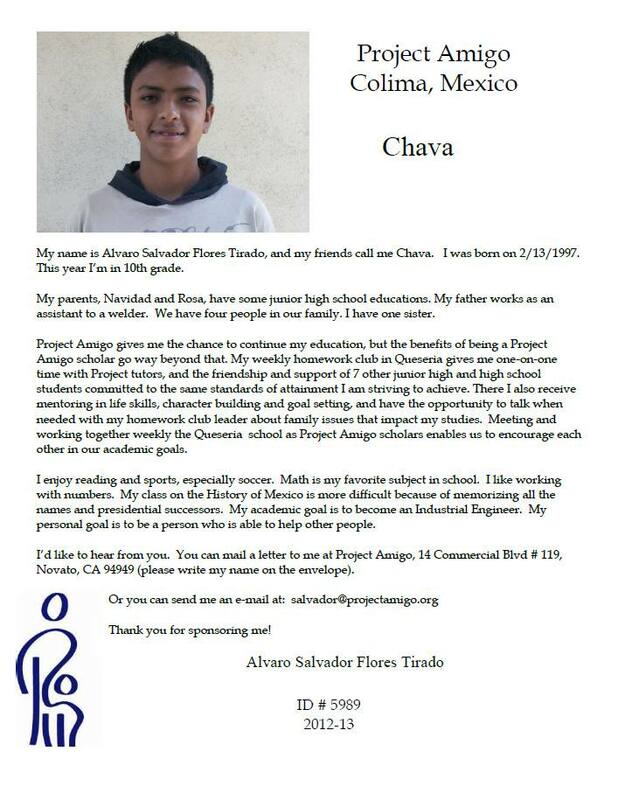 For more information, please contact Project Amigo Coordinator, Will Haymaker.